A member of the British Vorticist movement, the painter Edward Wadsworth studied engineering before training as a painter first at the Bradford School of Art and later, from 1908 to 1912, at the Slade School of Art in London. In 1912 he joined Roger Fry’s Omega workshops, where he remained for only a short time before leaving to team up with Wyndham Lewis on his project to establish the Rebel Art Centre. Wadsworth hailed from a family of industrialists from the Bradford area, which is perhaps why, like many contemporary artists, he was attracted by machines. 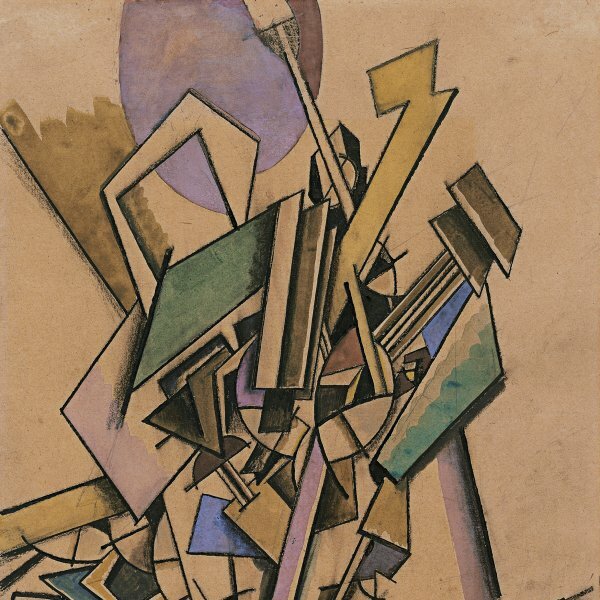 His Vorticist works — mostly destroyed or their whereabouts unknown — began to feature elements that referred to a mechanised world and denoted familiarity with Italian Futurist art. However, despite being one of the organisers of the dinner held in London in honour of Filippo Tommaso Marinetti in 1913, Wadsworth objected to certain aspects of the movement. He admired the work of Wassily Kandinsky and published his English translation of Concerning the Spiritual in Art in the Vorticist magazine Blast, created by Lewis. After taking part in the Vorticist Exhibition at the Doré Gallery in 1915, Wadsworth served in the Royal Navy volunteer reserve and after the war he and Lewis went their separate ways. He developed a renewed interest in representing the real world in his art, although he continued to centre on depicting machines and also seascapes — another theme present in his earlier work. In 1933 he was a founding member of Unit One, a group devoted to promoting artistic renewal in Britain, and in 1934 the realism of his paintings acquired a magical quality, an aspect shared with the Surrealist trends.